Form Description: Good staff are important to your business. So are improving their skills and performance. You can use our performance evaluation forms to help in your analyses, whether it's your annual reviews or a promotion decision. Team analyses allow you to measure how well your staff work together in serving your customers and achieving your company objectives. The basic team self-evaluation form includes information at the top on the employees, the period being reviewed, and the team's responsibilities and accomplishments. An itemized list of competencies with a simple rating scale allows for accurate qualitative measurement. Also includes information on performance on current goals and space to plan the following period's goals. Space is given for long-form information on the team's expected challenges and needs, improvement plan, suggestions for the organization, and general comments. There are places throughout for a supervisor to add comments and observations. This document is in full-page portrait format. 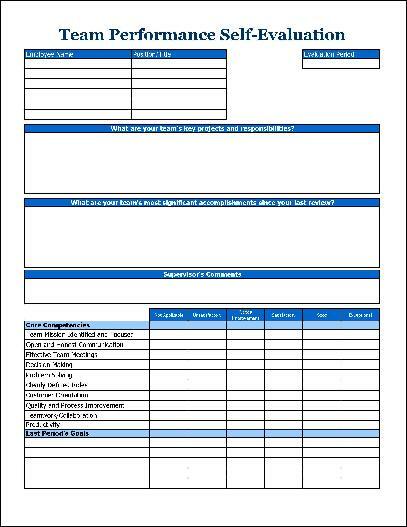 You can download a PDF version of the "Basic Team Performance Self-Evaluation" form absolutely free. You can also, for a small payment, download a fully editable version of the form that you can customize as you desire. (Don't know which format to choose? Here's how to make your choice.) What would you like to do? Formville's free "Basic Team Performance Self-Evaluation" form is associated with the following keywords: performance evaluation, employee evaluation, human resources, employee performance review.